Background: Deep brain stimulation (DBS) is a commonly used neurosurgical approach for the debilitating motor symptoms of Parkinson's disease (PD). A number of neurostimulation products have been developed, including the Medtronic implantable neurostimulator (Medtronic USA, Inc., USA) and a wirelessly programmed implantable neurostimulator (Sceneray Co. Ltd., China) with protection by independent intellectual property rights in China. This study will validate the safety and efficacy of implantable neurostimulators in the treatment of primary PD. Methods/Design: This is a prospective, single-blind, randomized parallel-controlled optimal-efficiency trial, which will be performed in five research centers. Sixty-four patients with middle-stage and advanced-stage idiopathic PD will be randomly assigned to an experimental group and a control group according to a 1:1 ratio. An implantable neurostimulator will be implanted in each participant in both groups, but the stimulator will be activated within 1 month of surgery in the experimental group, while the patients in the control group will not receive stimulation until 3 months after implantation. After 3 months, patients in both groups will receive stimulation from the implanted neurostimulator. Beginning 6 hours after implantation, all participants will receive anti-PD drugs such as dopamine receptor agonists and compound levodopa. The primary outcome measure in this study will be changes in motor function score (Unified Parkinson's Disease Rating Scale (UPDRS)-III), relative to the baseline value, in patients from each group upon withdrawal of medications for 12 hours at 3 months after surgery. 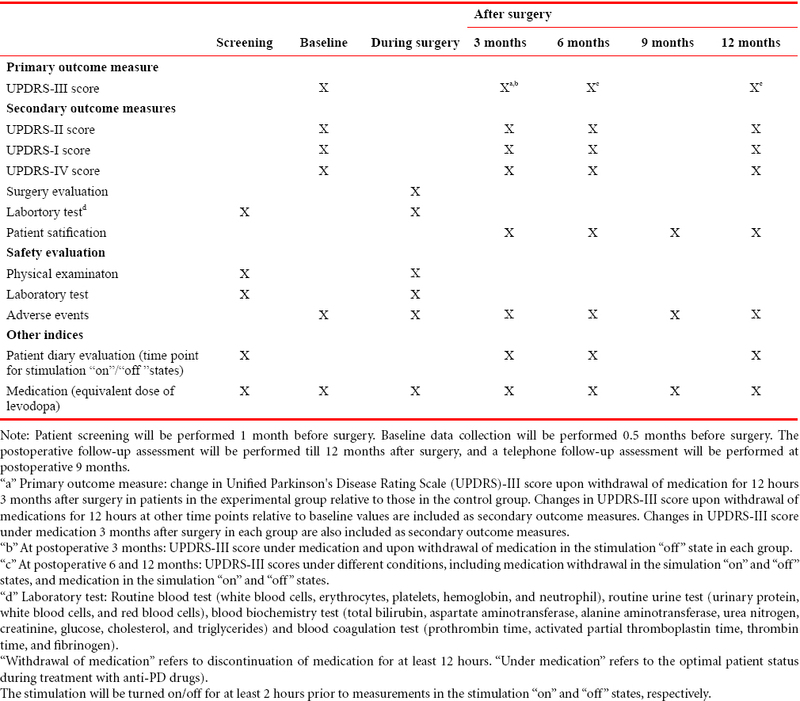 The secondary outcome measures for this study include (1) changes in UPDRS-I, II, III, and IV scores in patients from each group under the influence of medication at 3, 6, 9, and 12 months after surgery relative to baseline values; (2) changes in UPDRS-III scores upon withdrawal of medications 12 months after surgery in stimulation "on" and "off" modes relative to baseline value; (3) patient satisfaction. Safety indices are the numbers and incidences of adverse events. Discussion: This study is the first to investigate the safety and efficacy of a wirelessly programmed implantable neurostimulator enforced with protection by independent intellectual property rights in China through a randomized controlled trial. If safe and effective outcomes are acquired, this implantable neurostimulator will become a new option for treatment of PD patients. Trial registration: This trial was registered at http://www.chictr.org.cn (registration number ChiCTR-INR-16008951) on 1 August 2016. Ethics: The study protocol has been approved by the Ethics Committee of Tangdu Hospital of the Fourth Military Medical University of China (approval number: 2012009); Ethics Committee of Changhai Hospital of China (approval number: CHEC2012-044); Clinical Trial Ethics Committee, Ruijin Hospital, Shanghai Jiao Tong University School of Medicine of China (approval number: 2012-67); Clinical Trial and Biomedical Ethics Committee of West China Hospital of Sichuan University of China (approval number: 2012-7); Ethics Committee of First Affiliated Hospital of Guangzhou Medical University of China (approval number: 2013-8). The study protocol will be performed in strict accordance with the Declaration of Helsinki, formulated by the World Medical Association. Parkinson's disease (PD), also termed paralysis agitans, mostly occurs in people over the age of 55 years. Typical symptoms include resting tremor, rigidity, bradykinesia, and postural balance disorder (Samii et al., 2004; Jankovic, 2008). PD is clinically considered to be a chronic progressive central nervous system disorder resulting from the degeneration of dopaminergic neurons (Sveinbjornsdottir, 2016) due to a lack of dopamine transmitter in the nigrostriatal system. Deficient neurotransmitter dopamine in the brain leads to PD symptoms such as tremor, rigidity, and bradykinesia (Jankovic, 2008; Obeso et al., 2008). Treatment with levodopa and other drugs can improve the quality of life in PD patients, but with disease progression and increasing dosage, drug efficacy may gradually weaken, leading to severe complications and even drug nonefficacy (Poewe, 2006). Deep brain stimulation is considered as an option when the symptoms of PD cannot be effectively controlled via pharmaceutical treatment (Bronstein et al., 2011). In 1987, Benabid used high-frequency stimulation to determine the extent of lesions before dissecting the thalamus and found that high-frequency stimulation could improve symptoms of PD without permanent destruction of brain tissue (Carron et al., 2011). According to this finding, Medtronic USA, Inc., developed an implantable neurostimulator. In the early 21 st century, The Chinese Food and Drug Administration approved the use of the Medtronic implantable neurostimulator in China. Every year, over 1,000 people undergo PD treatment with the Medtronic implantable neurostimulator in China, and this number is now approaching 10,000 annually in the U.S. The Medtronic implantable neurostimulator is relatively expensive, which limits its use in some patients. To address this, Sceneray Co. Ltd., designed a wirelessly programmed implantable neurostimulator with protection by independent intellectual property rights in China (Zhang et al., 2016), which has been certified and inspected by the Shanghai Testing and Inspection Institute for Medical Devices. That the wirelessly programmed implantable neurostimulator is suitable for clinical use has been verified by the results of an animal experiment conducted at the Fourth Military Medical University, China (Chen, 2012). To validate the safety and efficacy of a wirelessly programmed implantable neurostimulator, designed by Sceneray Co. Ltd., in the treatment of middle-stage to advanced-stage idiopathic PD. Deep brain stimulation for the treatment of PD via an implantable neurostimulator has become an increasing topic of interest. From 2013 to 2016, we counted 46 similar clinical papers in the Medline database and 40 trials registered on ClinicalTrials.gov. We summarize some typical clinical trials and experiments in [Table 1] and [Table 2]. This study is the first to assess the use of the wirelessly programmed implantable neurostimulator designed by Sceneray Co. Ltd. for deep brain stimulation in PD patients. A prospective, multicenter, single-blind, randomized, parallel-controlled optimal-efficiency trial. All medical institutions involved in this study have been approved by the China Food and Drug Administration for clinical drug trials. All researchers participating in this trial will be experienced in neurostimulator implantation, specifically; they will conduct surgeries and post-surgery management in more than 100 patients. Trials will take place at the following medical institutions: Tangdu Hospital of the Fourth Military Medical University, Changhai Hospital in Shanghai, Ruijin Hospital of the Shanghai Jiao Tong University School of Medicine, West China Hospital of Sichuan University, and the First Affiliated Hospital of Guangzhou Medical University, China. This study will investigate the therapeutic effects of deep brain stimulation via a wirelessly programmed implantable neurostimulator on middle-stage and advanced-stage idiopathic PD patients though a prospective, multicenter, single-blind, randomized, parallel-controlled optimal-efficiency trial. (1) Sixty-four patients with middle-stage and advanced-stage idiopathic PD will be randomly assigned to an experimental group or a control group according to a 1:1 ratio. Participants in both groups will undergo neurostimulator implantation surgery. In the experimental group, the stimulator will be turned on within 1 month, but participants in the control group will not receive stimulation until 3 months after implantation. After 3 months, patients in both groups will receive stimulation treatment via the implantable neurostimulator. (2) Commencing 6 hours after implantation, all participants will receive anti-PD drugs such as dopamine receptor agonists and compound levodopa. (3) The primary outcome measure of this study will be changes in motor function score (Unified Parkinson's Disease Rating Scale (UPDRS)-III), relative to baseline value, in patients from each group upon withdrawal of medications for 12 hours at 3 months after surgery. The secondary outcome measures of this study include: (1) changes in UPDRS-I, II, III, and IV scores relative to baseline values in patients from each group under the influence of medication at 3, 6, 9, and 12 months after surgery; (2) changes in UPDRS-III scores upon withdrawal of medications 12 months after surgery in the stimulation "on" and "off" modes relative to baseline values, and (3) patient satisfaction. Safety indices include numbers and incidences of adverse events. The study protocol is shown in [Figure 1]. 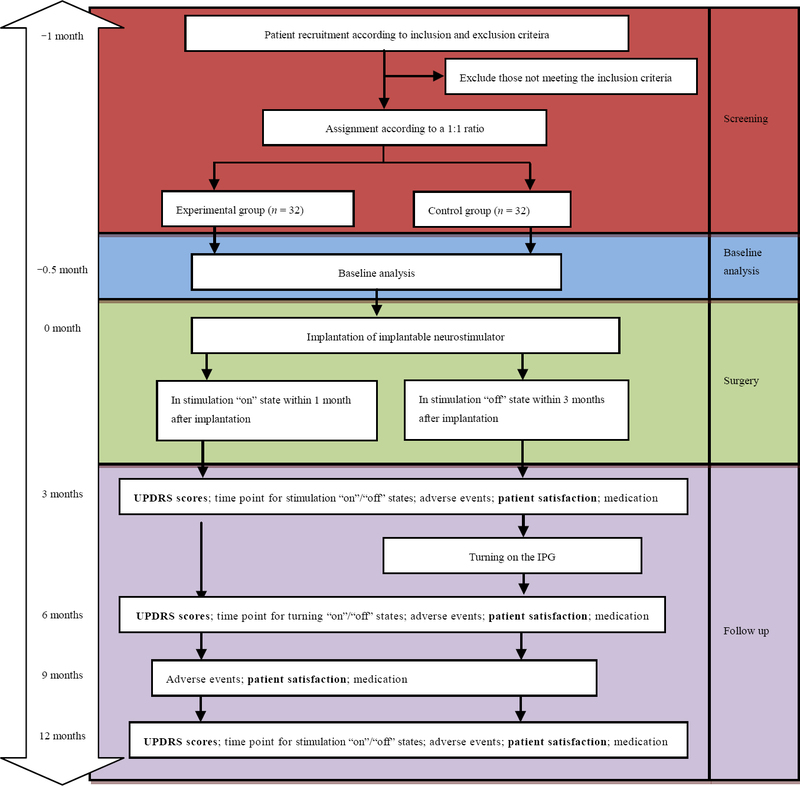 Figure 1: Flowchart of the study protocol. medications for 12 hours at 3 months after surgery. Patients with middle-stage and advanced-stage idiopathic PD scheduled to undergo deep brain stimulation via an implantable neurostimulator will be recruited from Tangdu Hospital of the Fourth Military Medical University, Changhai Hospital in Shanghai, Ruijin Hospital of the Shanghai Jiao Tong University School of Medicine, West China Hospital of Sichuan University, and the First Affiliated Hospital of Guangzhou Medical University, China according to the inclusion, exclusion, and withdrawal criteria. This trial will use interactive voice response (IVR) and interactive web response (IWR) systems. The National Center for Cardiovascular Diseases will be responsible for assigning the patients to groups according to a 1:1 ratio. Patients will be included according to inclusion/exclusion criteria. After providing a signed informed consent form and completing an application for randomization, patients will be randomly assigned to the experimental group or the control group via IVR/IWR systems. Information regarding assignment numbers and corresponding treatments (experimental or control group) will be recorded on the application form and original medical case notes for each participant. If randomization is performed via the internet, a randomization checklist, including the number corresponding to the clinical trial center, the number of patients, the randomization number for the participant, group, and date of randomization, will be printed. If randomization is performed via telephone, researchers will fax the randomization application forms to the "randomization office" within 2 days for verification of the information. The "randomization office" will then fax the randomization checklist to the corresponding clinical trial center within 2 days. In each clinical trial center, the randomization checklist and other randomization files (randomization application forms) will be stapled together and safely kept for future inspection. During the trial, if it is necessary to adjust the case numbers in one clinical trial center, that center will be expected to apply for the changes in advance. After communication, the "randomization office" will adjust the randomization system to reflect the changes. The manufacturer will then be asked to make an adjustment regarding the number of neurostimulator systems used in each clinical trial center. To ensure the safety of patients, patients will be able to independently turn off the stimulators. Thus, only the assessors will be fully blinded to the grouping. The sample size was determined according the characteristics of implantable neurostimulators and statistical principles. The objective of this study is to investigate the therapeutic effects of the stimulation on individuals with middle- and advanced-stage PD in the experimental group versus the control group. The primary endpoint is the change in UPDRS-III score 3 months after surgery relative to the baseline value. in which χT and χC represent the expected curative effects in the experimental and control groups, respectively. If the data collected from this trial indicate that changes in UPDRS-III score are significantly greater in the experimental group compared with the control group, then the implantable neurostimulator developed by Sceneray Co. Ltd., will be considered to meet the clinical requirements. The primary endpoint of this trial is the change in UPDRS-III score upon withdrawal of medication 3 months after surgery relative to the baseline value. Okun et al. (2012) conducted a similar study in which they evaluated the efficacy of a neurostimulator for treatment of PD. They reported that the difference in UPDRS-III score change upon withdrawal of medication 3 months after surgery relative to the baseline value was -14.0 between the experimental and control groups, with a 95% confidence interval of [-17.5, 10.5]. Based on a previous study (Okun et al., 2012) and our preliminary clinical experience, we expect the UPDRS-III score to decrease by 15 points in patients in the experimental group versus those in the control group, and we conservatively estimate the combined standard error among the two patient groups to be 20 points. Using statistical principles, we determined the necessary sample size to be n = 28 patients per group, with a significance level of α = 0.05 (two-sided) and power = 80%. Thus, we expect to include at least 56 patients in this trial. Given an estimated drop-out rate of 10%, we require 32 patients per group. where χT and χC refer to the expected therapeutic effects for the experimental and control groups, respectively, σ indicates the standard error of the combined therapeutic effects for these two groups, μ is the quantile under standard normal distribution, α is type I error (here α = 0.025), and β is type II error (here β = 0.2). Baseline information will be collected at admission. Details are shown in [Table 3] . Attending physicians will inform their patients in the wards and clinics of the Department of Neurology at the five clinical trial centers about the trial. Patients who are interested in participating in the trial will be able to contact the responsible researchers via telephone, e-mail, or WeChat. The implantable neurostimulator developed by Sceneray Co. Ltd., China is composed of an implantable neurostimulator, neurostimulator electrode, testing stimulator, program controller (for surgeons), and patient controller. The control chip and stimulus chip deliver a high-frequency pulse (constant current or voltage) to targets in the brain via the electrode cable and extension cable. The stimulus program, stimulus parameters, and on/off status can be controlled by the program controller (for surgeons). This system is programmable in a wireless manner, which we expect will result in improved ease of use for surgeons and patients, especially during the implantation surgery (Zhang et al., 2016). This implantable neurostimulator has been certificated by inspected by the Shanghai Testing and Inspection Institute for Medical Devices, China, and also meets the national GB/T16886 criteria (The General Administration of Quality Supervision, Inspection and Quarantine of People's Republic of China and Standardization Administration of the People's Republic of China, 2011). Preliminary animal experiments performed at the Fourth Military Medical University indicated that deep brain stimulation via this implantable neurostimulator is effective and safe (Chen, 2012). Preoperative preparation: Following routine preoperative and laboratory examinations, attending physicians will evaluate patient baseline information and engage in preoperative communication with the patients and their relatives. We expect that comprehensive guidance regarding preoperative medication will be provided to all patients. To enable observation of the immediate therapeutic effects of subthalamic nucleus stimulation by the implantable neurostimulator during the surgery, we expect patients to terminate or reduce the dose of anti-PD medication before surgery according to the condition of disease. This will ensure that patients are in a relatively "closed-loop" state during the surgery (it is important that patients cooperate with surgeons during the surgery). Stereotactic implantation of neurostimulators: The researchers will implant both neurostimulators in one surgical session or in two separate surgeries steps according to the condition of the patient. After local anesthesia, MRI/CT scans of the head will be performed and the subthalamic nuclei will be directly or indirectly targeted. After local anesthesia or general anesthesia, a pore will be drilled for the implantation of the stimulating electrode. After electrode fixation and stimulator and extension cable connection, wounds will be sutured. Postoperative management: Starting 6 hours after the patient recovers from anesthesia, they will receive anti-PD drugs, such as dopamine receptor agonists and compound levodopa. The initial dose of postoperative medication will be adjusted according to the reaction of the patient. At the end of the first postoperative month, drug dose will be reduced in the experimental group. Nerve stimulation: Stimulation will only be conducted when brain edema has subsided and the patient is considered to be in good general medical condition. At this point, stimulation will be initiated by turning on the on/off switch (i.e0., first program control). As mentioned, patients in the experimental group will begin to undergo stimulation within 1 month of neurostimulator implantation and those in the control group will not undergo stimulation until 3 months after surgery. The stimulation frequency will be 130 Hz with a pulse width of 60 ms, and the voltage will be adjusted to a maximum of 3 V according to the patient reactions. After turning on the switch, the neurostimulator system will emit stimulation for 24 hours per day except when dyskinesia occurs or during the examination of motor function at follow-up assessments. If dyskinesia occurs, the dose of medication should be reduced immediately until the symptoms of dyskinesia disappear. If patients experience dyskinesia outside of the hospital, they will be asked to turn off the switch and visit the hospital as soon as possible. The following outcome measures will be evaluated. "Withdrawal of drugs" refers to the discontinuation of medication for at least 12 hours. "Under medication" refers to the patient's optimal status with respect to treatment with anti-PD drugs. The stimulation will be turned on/off for at least 2 hours prior to assessments, which will be recorded as stimulation "on" and stimulation "off" states, respectively. The changes in UPDRS-III score in patients from each group upon withdrawal of medication 3 months after surgery, relative to the baseline value. The UPDRS is used to analyze the longitudinal course of PD and is the most commonly used scale in the clinical study of PD. It consists of four parts (Fahn and Elton, 1987): Part I: evaluation of mentation, behavior, and mood. This information can be collected as part of the medical history of a patient, and is unrelated to the "open-loop" or "closed-loop" state of the patients. Part II: evaluation of history of diseases. This is not particularly associated with the "open-loop" or "closed-loop" state of the patients. Part III: evaluation of motor function, which specifically concerns the "open-loop" or "closed-loop" state of the patients. Part IV: history of disease within the week before the follow-up assessment. This is not specifically related to the "open-loop" or "closed-loop" state of the patients. Each item in the UPDRS will be scored using a 5-point scale where a score of 0 indicates normal and a score of 4 indicates extremely abnormal function. Physical examinations: Physicians will conduct heart and lung examinations, and evaluate the body height, body mass, and vital signs (blood pressure, pulse) of the patients prior to surgery, after surgery, and before discharge. Laboratory examination: Physicians will order and evaluate data from a routine blood test, routine urine test, urine pregnancy test, blood biochemistry test, and complete examinations of hepatic and renal function (bilirubin, alanine aminotransferase, aspartate aminotransferase, urea nitrogen, creatinine) for patients prior to surgery, after surgery, and before discharge, with the purpose of investigating any abnormal changes that may have clinical significance. The schedule of the trial procedure is shown in [Table 4]. Any medical abnormalities occurring from recruitment to the end of the observation period, regardless of whether they are directly associated with the experimental procedure, will be considered adverse events. All adverse events, including those reported by surgeons and those reported by patients, will be recorded in the medical case notes and case report forms. The severity of the condition will be graded as mild, moderate, or severe. We will judge the degree of the causal relationship between adverse events and neurostimulator use according to the following criteria: (a) positively related: the patient reaction corresponds to symptoms that manifest after use of the neurostimulator in terms of rational timing and reaction type; (b) likely related: based on (a), the clinical condition of the patient or evidence that other similar treatments may also lead to the same reactions; (c) likely unrelated: not all reactions correspond to manifestations that occur after use of the neurostimulator in terms of rational timing and reaction type; other treatments may also lead to the same reactions; (d) unrelated: reactions do not correspond to manifestations that occur after use of the neurostimulator, similar reactions can be elicited by other factors related to the patient clinical status and other treatments, reactions disappear after termination of other treatments and reappear after resuming treatments; and (e) cannot be assessed: there is no defined relationship between the reaction appearance and timing of neurostimulator use, reactions are similar to known reactions elicited by the neurostimulator, other treatments used simultaneously can also elicit the same reactions. Adverse events will be considered severe if one or more of the following occurs: (a) death; (b) life-threatening condition; (c) hospitalization or prolonged hospital stay; (d) permanent or severe mutilation; or (e) congenital deformity and congenital deformity. 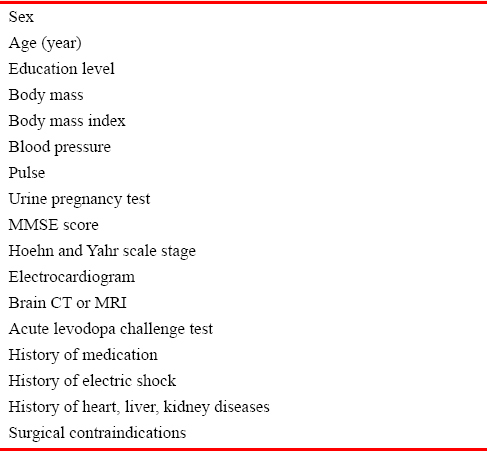 For all adverse events, regardless of whether they are related to the experimental procedure, proper clinical care will be administered immediately and the relevant information will be reported to the Safety Supervision Department of the State Food and Drug Administration (China), the principal investigator, and the institutional review board within 24 hours via telephone or fax. All adverse events should be followed up with a detailed record of the process and results until they are properly resolved or diseases are stable. Patients with abnormal laboratory test results should be followed up until indices return to normal. Data collection: An appointed research associate will periodically visit the clinical medical institute to ensure a strict operation process and accurate collection and storage of information. All researchers involved in this study will be trained together to ensure uniform judgment criteria and data collection methods. The entirely clinical trial will be strictly controlled. Case report forms will be completed by researchers. Information accuracy will be rechecked to ensure real and reliable data. Data management: Recorded data will be confirmed by researchers and processed using EpiData3.0 software. The clinical trial institute in each medical center will preserve all data related to this trial for at least 5 years after study completion. Data analysis: Data will be made available to a professional statistician for statistical analysis. The researchers in each center will produce an outcome analysis report that will be submitted to the leader center. A final trial report will be made by the leader center. The therapeutic effects of the treatment will be analyzed in terms of the full analysis and each protocol. All baseline demographic data will be analysed based on the full analysis set, and safety evaluations with be evaluated based on the safety set. The full analysis set refers to the patient set according the intention-to-treat principle. For patients who do not exhibit obvious therapeutic effects, the "last observation carried forward" principle will be used. The per protocol set refers to the subpopulation of patients who undergo treatment but they greatly deviate from the protocol, for example, by not meeting the inclusion/exclusion criteria. The safety set refers to a population of patients who have been randomized and undergo at least one safety evaluation. Count data will be expressed as frequency and constituent ratios, and measurement data as mean, standard deviation, maximum, minimum, median, 25 th quantile, and 75 th quantile. We will use a continuity-corrected chi square test to compare the count data between the experimental and control groups. When the instances of count data with values of less than 5 comprise more than 25% of the data set, we will use Fisher's Exact test. An independent t-test will be used to compare normally distributed measurement data between groups, and the Wilcoxon signed-rank test will be used to compare non-normally distributed measurement data. For the primary outcome measure, we will use an analysis of covariance to adjust the center and baseline effect. When the variances are equal in each medical center, the minimum mean square, minimum mean square error, and 95% confidence interval of the dependent variance will be determined, and the differences between the groups and the 95% confidence intervals will be further estimated. As for other indices regarding therapeutic effects, we will use the same statistical methods for comparison between groups as those used for baseline analysis. A paired t-test will be used to compare normally distributed measurement data before vs. after treatment in the same group. The Wilcoxon Sign Rank test will be used to compare non-normal measurement data before vs. after treatment in the same group. In each group, the number and percentage of patients who exhibit normal medical status before treatment but abnormal status after treatment will be counted and calculated. Adverse events will be evaluated by summing the number of patients who experience adverse events and testing this value using a continuity-corrected chi square test and Fisher's Exact test. The clinical manifestations and severity of all adverse events and their relationship to the product (i.e., neurostimulator) will be recorded. All statistical analyses will be performed using SAS9.13 software with a significance level of 0.05 level (P = 0.05, two-sided). Data entry will be performed using EpiData 3.0. The trial progression will be reported to the ethics committee at each clinical trial center every 3 months and the trial status will be updated in the registration center. Patient identifier information will be preserved by each clinical trial center and not exposed to any non-authorized persons unless the law requires it. Anonymized trial data will be published as part of the scientific objective. Clinical trials had been performed by December 2012. Data processing and analysis has been performed at the time of submission. Our related studies are shown in [Table 5]. Implantable neurostimulators are widely used for treatment of PD. Every year, more than 300 PD patients undergo deep brain stimulation by a wirelessly programmed implantable neurostimulator at the five clinical trial centers involved in this study. Sceneray Co. Ltd., China developed a wirelessly programmed implantable neurostimulator for deep brain stimulation. This study is the first to evaluate the safety and efficacy of deep brain stimulation by this wirelessly programmed implantable neurostimulator, enforced with protection by independent intellectual property rights in China, for the treatment of middle- and advanced-stage idiopathic PD. Implantable neurostimulator products have been used for many years. Prior to the present clinical trial, the Sceneray Co. Ltd., wirelessly programmed implantable neurostimulator was inspected and certificated by the Shanghai Testing and Inspection Institute for Medical Devices. According to the GB/T16886 criteria, biological tests were performed on the implantable part of the implantable neurostimulators, including a sensitization test, skin irritation test, systemic toxicity test, pyrogen test, subcutaneous and intramuscular implantation test, subchronic systemic toxicity test, Ames test, cytotoxicity test, and an in vitro mammalian cell gene mutation test. The results of all these tests indicate that the device meets the standard requirements (Chen, 2012). Therefore, the safety of this wirelessly programmed implantable neurostimulator is expected to be satisfactory. Deep brain stimulation has been used as a medical treatment globally for more than 20 years. The clinical application of this therapy has increased over the past 10 years in China. The five clinical trial centers that agreed to take part in this clinical trial are bases for national drug clinical trials. All surgeons involved in this trial have completed the successful implantation of Medtronic neurostimulators in more than 30 patients and are capable of professional techniques regarding microelectrode target recording of the subthalamic nucleus and pallidum such that they are able to accurately recognize the optimal position for electrode implantation. Rescue equipment has been installed in each clinical trial center to ensure that if unexpected severe adverse events occur, patients will receive treatment as soon as possible. Compared with those that have a conventional program-controlled mode, the wireless function of the implantable neurostimulator used in this study is advantageous from the perspective of safety. Specifically, this device enables increased maneuverability, reduced intraoperative risk of infection, and decreases the time length required to adjust the stimulation program ([Table 6]) (Zhang et al., 2016). Neurostimulator implantation is minimally invasive, but requires high technique and equipment standards. The surgical process is complex and any deviation can lead to surgical failure. Inaccurate positioning prior to surgery can result in improper neurostimulator location, leading to an unsuccessful surgery. Therefore, precise preoperative evaluations, examinations, and screening for suitable patients are extremely important to ensure a positive surgical outcome. Additionally, the primary outcome measure of this study is a subjective index, which will unavoidably be influenced by subjective factors. Therefore, further analyses should be performed involving a relatively objective index. Bronstein JM, Tagliati M, Alterman RL, Lozano AM, Volkmann J, Stefani A, Horak FB, Okun MS, Foote KD, Krack P, Pahwa R, Henderson JM, Hariz MI, Bakay RA, Rezai A, Marks WJ, Moro E, Vitek JL, Weaver FM, Gross RE, et al. (2011) Deep brain stimulation for Parkinson disease: an expert consensus and review of key issues. Arch Neurol 68:165-171. Carron R, Fraix V, Maineri C, Seigneuret E, Piallat B, Krack P, Pollak P, Benabid AL, Chabardès S (2011) High frequency deep brain stimulation of the subthalamic nucleus versus continuous subcutaneous apomorphine infusion therapy: a review. J Neural Transm 118:915-924. Charles D, Konrad PE, Neimat JS, Molinari AL, Tramontana MG, Finder SG, Gill CE, Bliton MJ, Kao CC, Phibbs FT, Hedera P, Salomon RM, Cannard KR, Wang L, Song Y, Davis TL (2014) Subthalamic nucleus deep brain stimulation in early stage Parkinson′s disease. Parkinsonism Relat Disord 20:731-737. Chen L (2012) High frequency stimulation of subthalamus neuclus reverse rotation induced by apomorphine in hemi-parkinsonism monkey. Xi′an: The Fourth Military Medical University. Cheng ZG, Gao GD, Wang XL, Li WX (2004) Deep brain stimulation of the subthalamic nucleus in Parkinson′s disease. Disi Junyi Daxue Xuebao 25:1755-1758. Fahn S, Elton RL (1987) Unified Parkinson′s disease rating scale. Recent Developments in Parkinson′s Disease. In: (Fahn S, Marsden CD, Calne DB, Goldstein M, eds). Florham Park, NJ, USA: Macmillan Healthcare Information. Gee L, Smith H, Cruz PDL, Campbell J, Fama C, Haller J, Ramirez-Zamora A, Durphy J, Hanspal E, Molho E, Barba A, Shin D, Pilitsis JG (2015) The influence of bilateral subthalamic nucleus deep brain stimulation on impulsivity and prepulse inhibition in Parkinson′s disease patients. Stereotact Funct Neurosurg 93:265-270. Guan DG, Gao GD, Wang XL, Li WX, Wang JL (2005) Deep brain stimulation on bilateral subthalamic nuclei for the improvement of tremor, gait and posture stability of patients with primary Parkinson disease. Zhongguo Linchuang Kangfu 9:24-26. Chinese Society of Neurology Parkinson′s Disease and Movement Disorder Team (2009) Chinese Parkinson′s Disease Treatment Guidelines (2 nd Edition). Zhonghua Shenjing Ke Zazhi 42:352-355. Guo XD, Gao GD, Wang XL, Xu GZ, Guo ZY, Ma LT (2012) Effect of bilateral deep brain sti(mu)lation of the subthalamic nucleus on olfactory function in patients with Parkinsons disease. Zhonghua Shenjing Waike Jibing Yanjiu Zazhi 11:236-240. Guo XD, Gao GD, Wang XL, Li LH, Liang QC, Li WX, J L (2008) The effect of bilateral subthalamic nucleus stimulation for Freezing of gait of Parkinson′s disease. Liti Dingxiang he Gongnengxing Shenjing Waike Zazhi 21:5-8. Hacker ML, Tonascia J, Turchan M, Currie A, Heusinkveld L, Konrad PE, Davis TL, Neimat JS, Phibbs FT, Hedera P, Wang L, Shi Y, Shade DM, Sternberg AL, Drye LT, Charles D (2015) Deep brain stimulation may reduce the relative risk of clinically important worsening in early stage Parkinson′s disease. Parkinsonism Relat Disord 21:1177-1183. Hoehn MM, Yahr MD (1967) Parkinsonism: onset, progression and mortality. Neurology 17:427-442. Jankovic J (2008) Parkinson′s disease: clinical features and diagnosis. J Neurol Neurosurg Psychiatry 79:368-376. Li D, Cao C, Zhang J, Zhan S, Chen S, Sun B (2013) Subthalamic nucleus deep brain stimulation for Parkinson′s disease: 8 years of follow-up. Transl Neurodegener 2:11. Li DY, Sun BM, Sun CY, Zhao YB, Zuo CT, Guan YH, Zhao J, Chen SD, Shen JK (2003) The effect of bilateral subthalamic nucleus stimulation on glocose metabolism of cerebrum in advanced Parkinson′s disease. Zhongguo Shenjing Jingshen Jibing Zazhi 29:414-417. 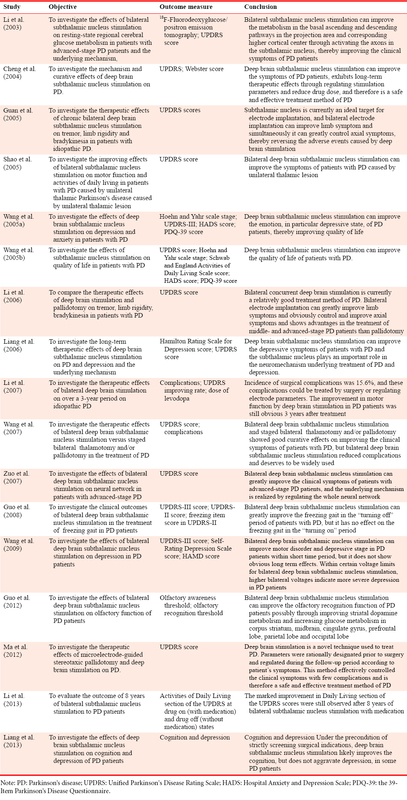 Li WX, Gao GD, Wang XL, He SM, Liang QC, Wang JL (2006) Comparison of deep brain stimulation and pallidotomy for Parkinson′s disease. Liti Dingxiang he Gongnengxing Shenjing Waike Zazhi 19:146-148. Li WX, Wang JL, Liang QC, He SM, Wang LX, Gao GD (2007) A three year follow-up of subthalamic nucleus stimulation for Parkinson′s disease. Zhonghua Shenjing Waike Jibing Yanjiu Zazhi 6:506-508. Liang JC, Hu XW, Zhou XP, Chen JC, Wu X, Hao B, Chen X, Liu JM (2013) Assessment of clinical effect on cognition and depression of subthalamic nucleus deep brain stimulation for Parkinson′ s disease (a cohort study). Linchuang Shenjing Waike Zazhi 10:142-144,151. Liang QC, Gao GD, Wang XL, Li WG, Guo XD (2006) Long-term effects of deep brain stimulation of bilateral subthalamic nuclei on depressive disorder in Parkinson′s disease. Zhonghua Shenjing Yixue Zazhi 5:1129-1131. Ma RJ, Zhang W, Liu Y, Sun BM (2012) Microelectrode oriented stereotactic technology brain damage and do the Kernel group deep brain electrical stimulation treatment of Parkinson′s disease to observe the result. Zhongguo Yiyao Daokan 14:1333-1334,1336. Obeso JA, Rodríguez-Oroz MC, Benitez-Temino B, Blesa FJ, Guridi J, Marin C, Rodriguez M (2008) Functional organization of the basal ganglia: Therapeutic implications for Parkinson′s disease. Mov Disord 23:S548-S559. Okun MS, Gallo BV, Mandybur G, Jagid J, Foote KD, Revilla FJ, Alterman R, Jankovic J, Simpson R, Junn F, Verhagen L, Arle JE, Ford B, Goodman RR, Stewart RM, Horn S, Baltuch GH, Kopell BH, Marshall F, Peichel D, et al. (2012) Subthalamic deep brain stimulation with a constant-current device in Parkinson′s disease: an open-label randomised controlled trial. Lancet Neurol 11:140-149. Pangman VC, Sloan J, Guse L (2000) An examination of psychometric properties of the Mini-Mental State Examination and the Standardized Mini-Mental State Examination: Implications for clinical practice. Appl Nurs Res 13:209-213. Phibbs FT, Arbogast PG, Davis TL (2014) 60 Hz frequency effect on gait in Parkinson′s disease with subthalamic nucleus deep brain stimulation. Neuromodulation 17:717-720. Poewe W (2006) The natural history of Parkinson′s disease. J Neurol 253:vii2-vii6. Samii A, Nutt JG, Ransom BR (2004) Parkinson′s disease. Lancet 363:1783-1793. Shao M, He JD, Tan HY, Cheng GW, Wu ZH, Yang SL (2005) Effects of bflateral subthalamic nucleus electrode stimulation in treating two patients with Parkinson disease after unilateral thomotomy. Zhongguo Linchuang Kangfu 9:20-21. Sveinbjornsdottir S (2016) The clinical symptoms of Parkinson′s disease. J Neurochem doi: 10.1111/jnc.13691. The General Administration of Quality Supervision, Inspection and Quarantine of People′s Republic of China, Standardization Administration of the People′s Republic of China (2011) GB/T16866 Biological Evaluation on Medical Device. Wang QS, Zhao YB, Sun BM, P WX (2005a) Effect of deep brain stimulation of subthalamic nucleus on anxiety and depression of patients with Parkinson′s disease. Linchuang Shenjing Bing Xue Zazhi 18:170-172. Wang QS, Zhao YB, Sun BM, Wang XP (2005b) The impact of bilateral deep brain stimulation of the subthalamic nuclei on the health-related quality of life in patients with advanced Parkinson′s disease. Zhongguo Shenjing Jingshen Jibing Zazhi 31:256-259. Wang XL, Chang CW, Geng N, Li N, Wang JL, Ma JH, Xue WN, Zhao W, Wu HM, Gao GD (2009) Effects of bilateral deep brain stimulation of the subthalamic nucleus on depression in patients with Parkinson′s disease. Zhongguo Shenjing Jingshen Jibing Zazhi 35:88-92. Wang YP, Wang XL, Li J, Hou YZ, Gao GD (2007) Comparison of deep brain stimulation and secondary lesion in treating Parkinson disease. Yixue Yanjiusheng Xuebao 20:163-166. Zhang C, Li D, Zeljic K, Tan H, Ning Y, Sun B (2016) A remote and wireless deep brain stimulation programming system. Neuromodulation 19:437-439. Zuo CT, Huang ZM, Li DY, Sun Bm, Zhao J, Guan YH, Lin XT (2007) 18 F-FDG PET imaging on the neuronal network of Parkinson′s disease patients following deep brain stimulation of bilateral subthalamic nucleus. Zhonghua He Yixue Zazhi 27:335-337. Wirelessly programmed implantable neurostimulators used in this study were developed by Sceneray Co. Ltd., China and Sceneray Co. Ltd., China will provide equipment and funds for this study. All authors designed this electrode and will conduct clinical trial, CCZ and DYL wrote the paper. All authors approved the final version of this manuscription for publication.